Linden Hills United Church of Christ welcomes two new staff members. Lawrence Richardson, who served as Communications Coordinator in the recent past will become the Interim Part-Time Minister for Faith Formation of Youth and Families and Daniel Pederson will become the new Minister of Music. You can learn more about each person in the article below. Please join Christian Education and the position search committee in welcoming Rev. Lawrence Richardson as our new Interim Part-Time Minister for Faith Formation of Youth and Families, effective September 4. The search committee evaluated several applicants and conducted interviews with 2 strong candidates, and we are thrilled that Lawrence has accepted our offer. Already well known to our congregation, Lawrence will immediately be able to step in to this role, providing stability and flexibility to our programming, while also helping to provide insight to CE as they work to define the long term scope of this position. In addition to his strong background in ministry, the committee was impressed at the great energy, enthusiasm and love he holds for our church families and community. Rev. Lawrence T. Richardson is a United Church of Christ pastor, writer, and digital evangelist. He uses multiple online platforms to advocate for social justice, express relevant content, and communicate inspired information. When he is not blogging and ministering, Lawrence spends his time enjoying nature, practicing yoga, and being an active presence in both the Transgender and Progressive Christian communities. 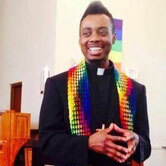 Most recently, he was pastor of Shift UCC, an online ministry to the transgender community. As he begins his new role, Lawrence will step down from his current volunteer position as CE Chair. 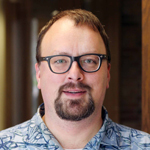 He has also been working for Linden Hills UCC this past year as the on-site facilitator for our church Vitality activities, and will have a short time of overlap in these roles until that term ends at the end of this year. The Music Search Committee (Christine Kolb, Dave Wilson and Connie Martin) are delighted to announce that Daniel Pederson has taken the position of Minister of Music at LHUCC! Daniel brings a wealth of skill and experience in church music as a pianist, organist and choir director. Most recently Daniel served as Music Director at Calvary Lutheran Church in Minneapolis. A native of North Dakota, Daniel is the son of a Lutheran pastor and has spent over 25 years as a church musician. He is an alum of North Dakota State University with a degree in music theory and composition and has published choral works through Augsburg Fortress and Hall Leonard. We look forward to more of the inspiring music we have enjoyed this summer, and to Daniel's expanded role as choir director. Join us in extending to Daniel our trademark Extravagant Welcome!